TWENTY MEN in blue blazers, grey flannel trousers and red ties—all members of the Trinidad football team—arrived at Southampton on Sunday in the banana ship Golfito. Afterwards they travelled to Weymouth, where on Wednesday, they will play the first of a 14-game series against West of England and London teams. Their first opponents will be the Dorset county FA team whom they will meet on the Weymouth ground. This is the first time since the Trinidad Football Association was formed in 1908 that a team has been sent to England. The players are all amateurs, who have been given three months' leave of absence from work at full pay by their employers. The Trinidad footballers are accustomed to playing only 30 minute each way and they have been taking special training at home to prepare for the 90 minutes of the British game. 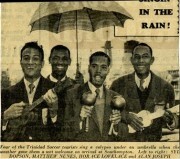 A special calypso has been composed for the arrival in England and when the players were welcomed in the ship's lounge by Sir Stanley Rous, Secretary of the Football Association and other officials, they played and sang it. The first words were: "Fire brigade water the road because Trinidad is coming down"
Baby of the team is Colin Agostini, a 20-year old undergraduate. Oldest member is Allan Fitzgerald Josephs, 36.